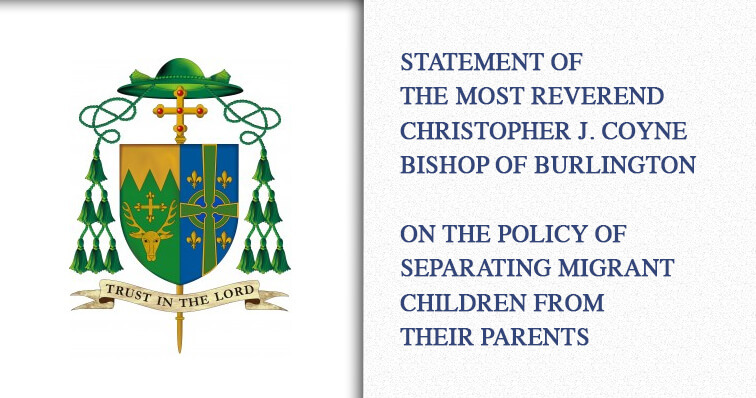 I write this statement in the midst of news reports that President Trump has signed an executive order ending his administration’s policy of separating migrant children from their parents at the border. I am relieved that the President has reversed his policy but I am saddened that the policy was implemented in the first place. This never should have happened. All we have to do is look in our own homes, at our own children and ask, “How would I feel if this was done to me and to them?” Devastated? Terrified? Tortured? Which leads to the next question, “Why would I do this to anyone else?” This policy runs absolutely contrary to Jesus’ teaching, “Do to others whatever you would have them do to you. This is the law and the prophets” (Matthew 7:12). We know deep in our hearts that this policy was wrong. Let me state unequivocally that our country has the absolute right to defend its borders and enact just laws and policies to do so. It is also true that illegal entry into the United States is a federal crime that requires action by the Department of Homeland Security (DHS). This is especially problematic when parents try to illegally enter with their children. When this happens, DHS has numerous options, only one of which is to separate the children from their parents. But, just because the separation of migrant children from their parents is a legal option, doesn’t mean it should be done, especially if it is being done for political reasons rather than to protect the children as is necessary in some cases. Why? Children are not bargaining tools. To treat them as such is morally offensive. In the meantime, this administration still has to figure out how to reunite the captive children with their imprisoned parents. This must be done as soon as possible to avoid further trauma for the children. I applaud the decision to rescind the present policy in this matter. I pray fervently it will not be repeated in the future.